It’s autumn in Sydney and while it’s still hot during the day, there’s a refreshing chill in the air in the mornings and evenings, and the intense humidity and monsoonal rains of March have eased off. I was going to post these black beans last week but when I checked my pantry, I discovered to my horror that I’d run out of black beans. The packet that I thought was black beans turned out to be dried cranberries (must find a use for those dried cranberries). The shock of running out of a staple led to an audit of my pretty chaotic pantry and the realisation that I had a serious surplus of red lentils and dried chickpeas that needed to be used up. Then there was the sugar – along with the usual white granulated, castor, brown and icing sugar (low G.I. and pure) – I also had two packets of palm sugar, dark jaggery, a couple of packets of golden castor sugar, 1½ packets of demerara sugar and a kilo of ordinary raw sugar. I can understand why I would have multiple packets of unopened and opened lentils and chickpeas ( I mean it would be disastrous to run out of red lentils and chickpeas) but the sugar overload is somewhat less explicable. If the state of your pantry is a reflection of the state of your mind, then my mind is obviously a pretty scary place. So last week, we ate chickpea soup and red lentil dahl but I still went out and bought black beans, because if you’re expecting the apocalypse, you just can’t have too many black beans in your cupboard. I posted a recipe for black bean chilli last year after a long and exhaustive search for the ultimate vegetarian chilli. The downside of its rich and complex unami flavor base is that it has such a long and exotic ingredient list – it’s a pretty daunting task to get everything together and actually make it. 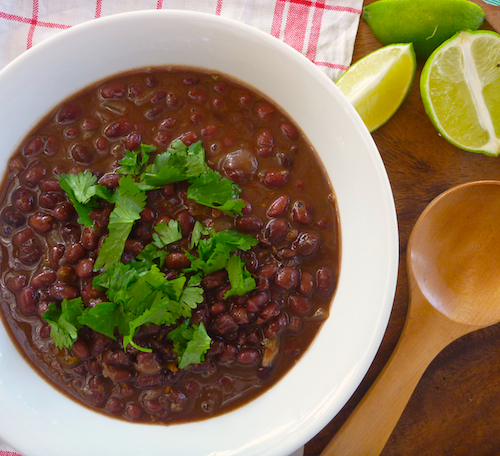 These spicy black beans are equally delicious in their own right but you don’t need to do any intense hunting and gathering to get them together. 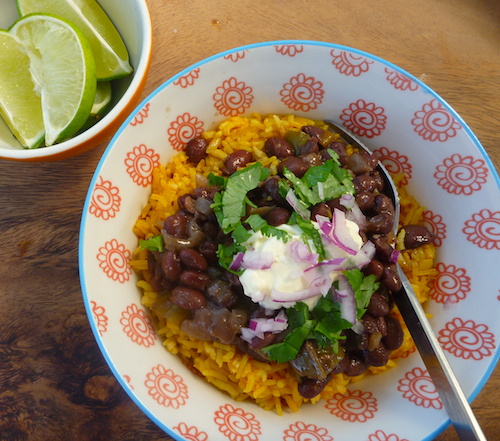 I don’t really need much of an excuse to post another black bean recipe – they are one of my favorite beans and I can’t have too many recipes for them. This recipe makes a heap of beans, so if you aren’t planning to feed a crowd or freeze a quantity of it, you really should halve the recipe. I generally make the full quota though, because it freezes beautifully and black beans are a popular meal in my house. This recipe is adapted from Simply Recipes and, originally, comes from the Field of Greens cookbook. I’ve made substitutions for ingredients like ancho chilli sauce and pureed chipotle in adobo, because they aren’t really available in Australia. I use a mix of ancho chilli powder and chipotle chilli powder in my chilli beans but if you don’t have those, regular chilli powder and some smoked paprika make perfectly adequate substitutes. If you’re cooking for kids, take care with the chilli, but I have to say, these beans taste best with a little bit of a bite to them. What more can I say? This makes a great vegetarian family meal: it’s cheap, cheerful and completely delicious. Serve it with Spanish rice and you have the beginnings of a fantastic burrito bowl. Chopped coriander (cilantro) to garnish. Rinse and sort beans and soak over night in cold water. Make sure you have at least 8 cm of water covering beans. Drain beans and place in large pot with 2 litres of water, oregano , bay leaves and sage. Bring beans to boil and reduce heat to simmer. I usually add about a tablespoon of olive oil to the beans at this stage to stop them frothing. Cook until beans are soft but not quite done. Depending on the age of your beans, this can take from between 30 minutes to an hour. Remove herbs and bay leaves from beans and remove but reserve bean broth so you have about 1 cm (½ inch) of liquid above beans. While beans are cooking, heat four tablespoons of olive oil and saute onions, peppers until translucent. Add chilli powder, chipotle/ smoked paprika and cumin, and saute until fragrant. Add onion, spices and salt to black beans and simmer beans for about an hour until broth thickens. Add reserved bean broth, if needed. Add half of the orange juice, simmer and adjust chilli heat at this stage. Just before serving, add remaining orange juice, lime juice, vinegar and adjust for salt. Garnish with lots of fresh chopped coriander. Serve with tortillas or rice, sour cream, cheese, salsa, guacamole and lime quarters. What a great recipe ~ it must be autumn as others seem to have yearned after beans 🙂 ! I actually have everything in my pantry/fridge bar the black beans – but having just about every other kind of bean in the house, I am certain some substitution is acceptable!!! Don’t quite know about these rains having finished!! After the worst thunderstorm for a decade last night we are totally rained in at the moment in the Southern Highlands with big angry arrows of lightning and thunder pointing your way on the weather radar 🙂 !! Yes the wild weather is certainly coming our way. Time to curl up inside. I’m making a self saucing chocolate pudding to celebrate the first wild storm of Autumn. This looks incredible Elizabeth. Perfect for nights in front of the TV watching the World Cup – another reason to look forward to winter! Yay the world cup is getting closer. Have to discuss football food – you’re right burrito bowls are perfect footy food. I can’t say that black beans are my favorites and I don’t think I’ve had them since I was in Haiti two years ago, but I’ve had this craving. I just bought a bag yesterday and I’m planning on beans on Tuesday. This recipe looks tasty. Black beans are a particular favorite of mine. I think it’s because of their lovely, rich gravy which makes them a very good vegetarian bean. I love gravy of all kinds. You’re making my tummy rumble Elizabeth those look so perfect for the weather we’ve been having here! That’s the point of difference with black beans the rich thick gravy. You can get the canned black beans in Sydney but they are generally so expensive I can’t be bothered buying them. 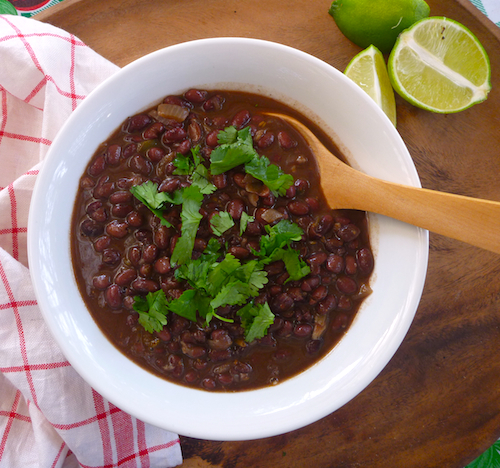 Ooh I’m a huge fan of black beans too, I’m adding this to the list of things I want to make over Easter to stock my freezer for the cold evenings ahead. Looks so warming and delicious! It freezes really well. I had some for lunch in cheese and bean quesadilla – very tasty. Snap! I just put some black beans to soak, now I have something delicious to do with them. Thanks! That’s joy of trawling the internet and finding a recipe for your ingredient list.